We’d love your help. Let us know what’s wrong with this preview of Out of the Woods by Rebecca Bond. To ask other readers questions about Out of the Woods, please sign up. Is this a kid's book? Safe for middle school kids to read? Every once in a while, I see a book that connects me to my childhood self, and to the things that aroused my sense of wonder then. This book is one of those. "Out of the Woods" is a true story, and is set by a lake in the woods in Ontario in 1914. The central figure is four-year-old Antonio Willie Giroux, who lives at the hotel his mother runs for vacationing sportsmen as well as for lumbermen and miners. The central event of the story is a forest fire that forces all the local inhabitants into Every once in a while, I see a book that connects me to my childhood self, and to the things that aroused my sense of wonder then. This book is one of those. "Out of the Woods" is a true story, and is set by a lake in the woods in Ontario in 1914. The central figure is four-year-old Antonio Willie Giroux, who lives at the hotel his mother runs for vacationing sportsmen as well as for lumbermen and miners. The central event of the story is a forest fire that forces all the local inhabitants into the lake. The resulting detente between humans and forest animals, and between predator and prey, is not less miraculous for the wariness shown by those involved. What a scary little story - but amazing at the same time. I felt it alongside the boy, the cold of the water and the long night standing there...I can only imagine how frighting and surreal this moment must have seemed. How any one survived such a thing is completely beyond me. How the hotel survived is a miracle. I love books like this that remind us that stories are absolutely EVERYWHERE. Even people like you and me who aren't famous have something that we've experienced that when retold like this becomes fascinating to the listener. We've lost something with the way we no longer carry this oral tradition of telling stories about our past the way our forebears did. Maybe this book is a reminder to tell our stories to our children and grandchildren. Rebecca Bond certainly brought her grandfather's memories to life in this picture book biography. I loved hearing, seeing, and even smelling his memories of living in a lodge in the Ontario woods. In the end, we have an amazing meeting of humans and animals, one I wish could have happened in Bambi. 1914. Gowganda Lake, Ontario. Five-year-old Antonio lives in his mother's tall wooden hotel full of hunters and trappers. He wanders in the woods but rarely see animals: wisely, they keep themselves hidden. But then one day a fire roars through the woods. The only safe place is the lake -- and not just for people. The tall, plain hotel's common rooms full of tables and bunks, and the cedars and poplars -- and creatures -- of the forest, are brought vividly to life in Bond's minutely inked illustr 1914. Gowganda Lake, Ontario. Five-year-old Antonio lives in his mother's tall wooden hotel full of hunters and trappers. He wanders in the woods but rarely see animals: wisely, they keep themselves hidden. But then one day a fire roars through the woods. The only safe place is the lake -- and not just for people. I really can't stand children's stories with a moral lesson. Thankfully this isn't it. Just a simple straight forward remembrance of a true childhood event. No real lead-in, no tidy wrap-up. It's good! This book has a magical feel to it. I think my students are going to enjoy it. Recommended by a friend, lovely, interesting little tale told in a simple way with nicely done illustrations. Goes to show that sometimes reality can also surpass imagination. Inspired by a true story, this picture book tells of the author’s grandfather’s life in Ontario, Canada in 1914. Antonio lived with his family in a hotel run by his mother. He spent his time with the hotel workers since there were no children around. He helped the cooks, the maids, and watched as others hauled wood and repaired buildings. The hotel had three stories with a space to feed crowds of people, individual rooms for travelers and then a large open dormitory space for others. He loved sp Inspired by a true story, this picture book tells of the author’s grandfather’s life in Ontario, Canada in 1914. Antonio lived with his family in a hotel run by his mother. He spent his time with the hotel workers since there were no children around. He helped the cooks, the maids, and watched as others hauled wood and repaired buildings. The hotel had three stories with a space to feed crowds of people, individual rooms for travelers and then a large open dormitory space for others. He loved spending time in the forest around the hotel too. Then one year when Antonio was almost five, it was dry as could be. When smoke was spotted in the distance, everyone knew they were in real trouble. All of the people fled the building and stood in the lake watching the fire come closer. Then something amazing happened and the animals too left the forest and entered the water, standing near the humans and close to one another, predator and prey alike. When the fire ended, the hotel was still standing and the animals returned to the burned forest, but Antonio never forgot what he witnessed that day. Bond captures the time period, allowing readers to really explore the hotel that Antonio lived in, showing us all of the floors and the hard-working men that the hotel served. The text offers details such as describing Antonio’s room as a place that was off the kitchen and had once been a pantry. Even small things are noted like the travel bags men carried and the fact that they sometimes had guns along too. Through these details, the entire hotel comes alive on the page. The illustrations in the book also add to the details from the long distance view of the hotel on the lake to the finely drawn images showing the interior. Small details are captured in sepia tones and fine ink lines, allowing us to get a glimpse into the past and a way of life. The same details continue even as the fire rages and the animals come into the water. Realistic and lovely, the animals’ body language shows how wary they are and yet how desperate too. Such an interesting, true story about a boy, Antonio, living in the woods in Canada in a hotel run by his mother. Their customers were lumberjacks, trappers, and miners and Antonio loved to go to the top floor and listen to their music and watch them play cards. But an event in the woods one night creates a memory for all. This story documents that event! The story is written and illustrated by Antonio's granddaughter. Rebecca Bond outdid herself with this beautifully executed book. Her intricate drawings are accented with watercolor washes in earth tones, which creates the mood of the time in which the story takes place. The story is told in the gentle poetic language of a grandparent. This is a must read for adults and children. What a lovely book. It would be a terrific story even if it was fiction, but it's not. Anyone who has felt the magic of woods and who is drawn to animals will love this one. Really stellar job of telling this through a child's eyes. This is a book for all readers - this moment in time, true story, will have readers thinking about this book long after they close the pages. A remarkable, magical true story handsomely illustrated. This feels like a story told and illustrated in just the right way to suit itself. Wow. 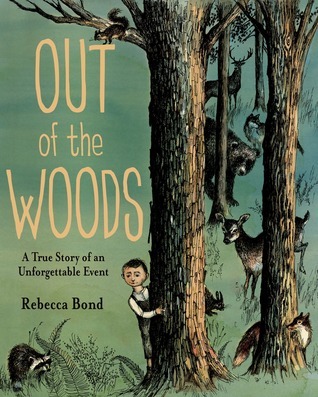 Out of the Woods: A True Story of an Unforgettable Event by Rebecca Bond is a great read aloud. The book introduces us to the early life of Antonio. He grew up in Canada in a hotel near Lake Gowganda in Ontario in 1914. That summer it was incredibly dry and a forest fire was burning and heading their way. The survival of the people and the animals in the area depended on the lake. The story surrounds that incident and reminds us in the midst of danger and trouble - you are never alone. The pen a Out of the Woods: A True Story of an Unforgettable Event by Rebecca Bond is a great read aloud. The book introduces us to the early life of Antonio. He grew up in Canada in a hotel near Lake Gowganda in Ontario in 1914. That summer it was incredibly dry and a forest fire was burning and heading their way. The survival of the people and the animals in the area depended on the lake. The story surrounds that incident and reminds us in the midst of danger and trouble - you are never alone. The pen and ink drawings are so well done and allow to see the story through Antonio’s eyes. Out of the Woods: A True Story of an Unforgettable Event by Rebecca Bond is a great read. This was a great story! It explained the experience of the author's grandfather in the early 20th century, who lived in a hotel run by his parents in the woods. The illustrations of this story seem to be very realistic and have great detail. The hotel, guests, and forest, are sketchy but very realistic artwork which makes them amazing. I love the calm scenery throughout the story as well. This is a great book for a read aloud as well. Tells of life at the edge of the forest and on the shore of a lake in Canada in 1914. The main character is a boy whose mother runs a hotel/boarding house used by both hunters/fishermen (short term visitors) and lumberjacks/miners/trappers (long term people). Life is interrupted by a huge fire that leads to all the people and the animals standing in the lake while the fire passes. Based in the life experience of the author’s Grandfather Antonio Willie Giroux, the tale shows how much we have in common. Would be a wonderful book for teaching past, present, and future. Would be an excellent choice to develop critical thinking, skills! This adaptable book lends itself to many learning opportunities in the classroom. I liked that this book was based on a true story. I liked how the beginning and the text were structured in a similar way. I also liked how the title wasn't mentioned until closer to the end of the story. I liked the detail put into the illustrations and how all of the illustration were created with dark colors. My daughter said to me, "Mom you have to read this book it is SOOO good!" Beautiful book and reminds me so much of home. A story of how people and animals can throw aside natural instinct when caught in a desperate situation. Oh to be the lucky little boy in this story who witnessed this amazing experience. I read easy picture books every day so i don't include them on my goodreads account but this one is such a lovely story that I had to include it. Almost like a fairy tale. Passed on in the oral tradition. A magical story with phenomenal illustrations! Wonderful descriptive text that creates a detailed image in your mind of an unforgettable true story experienced by a young boy in Canada. Well-done art/colors and retelling of her grandfather’s experience ‘out in the woods’ when a fire raged through the woods. A cool story, based on actual events. The illustration are wonderful in setting the time and place. I won't give anything away--it's a pretty magical story.